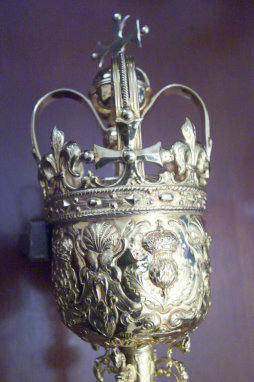 The Silver Gilt ceremonial mace was purchased for the Borough in 1669 at a cost of £35. The head consists of a Crown, Orb and Cross and is embossed with the Harwich Watergate, the Rose, Thistle, Prince of Wales Feathers and Harp, each surmounted with a Crown and surrounded by shells and scrolls. 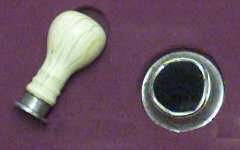 The staff has three bosses, the third ending in a pineapple knob. The cushion under the Crown bears the Royal Arms. 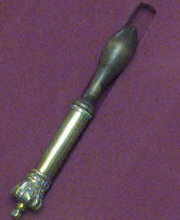 It is traditional for the Mace Bearer carrying the Mace, to precede the Mayor in civic processions to church or on other ceremonial occasions. 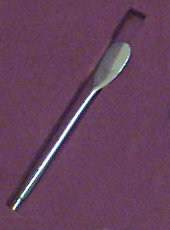 The Silver Oar, dated circa 1605 is 19cm long and is engraved with the Watergate symbol on one side of the blade and an Anchor on the reverse. It was carried by the Water Bailiff who accompanied the Mayor when exercising his authority for the Admiralty Court which had jurisdiction over shipping in the harbour and was mainly concerned with collecting harbour dues and charges. It was a symbol of the Water Bailiff’s authority. The two lesser maces are 30cm long plain silver rods, banded into five sections, surmounted by semigobular mace-heads. The flat tops are engraved with the Royal Coat of Arms of the Stuart sovereigns. The lower sections have three elegant open work flanges. Though they bear no hallmark, they are dated circa 1605. 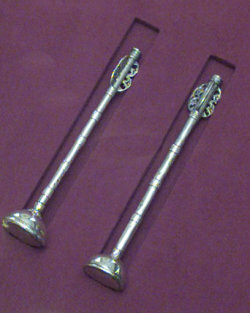 The lesser maces were carried by two Sergeants-at-Mace whose appointments were provided for in the 1604 Charter. These annually elected officials accompanied the Mayor on all his public excursions and acted as law enforcement officers. The ivory handled official Silver Seal has a chained Portcullis with three cross bars carved intaglio on the base. It is dated circa 1600. Provision was made for this seal in the 1604 Charter. Its impression was required to validate all official Council transactions. This antique Silver punchbowl 38cm in diameter and 24cm high was made in London in 1730. Engraved on one side is “The Gift of Carteret Leathes Esq. to this corporation in 1733.” On the other side are the arms and crest of the Borough of Harwich, bearing the inscription “Giles Baker Esq. 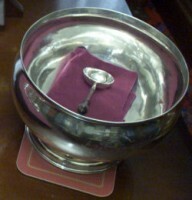 Mayor Harwich in 1733.” The accompanying antique Silver ladle with a Rosewood handle bears the “Leathes” crest. 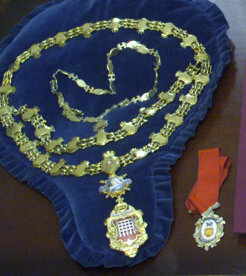 The Mayor’s Chain in 18 carat Gold was presented to the Council in 1884 by the Mayor A.J.H. Ward who had organised its purchase by public subscription. It consists of three parts: the chain itself and two detachable badges. The chain has 21 shield shaped links with mural coronets, inscribed on the reverse with a variety of names of mayors and members of parliament. A further row of nine 9 carat links has been added. All are joined by smaller links in the shape of an ‘H’. The central link is set with a Rose Diamond, surrounded by five Rubies set in green enamel leaves. The Mayor’s badge in 18 carat Gold shows the Borough Arms of Harwich with a Silver Watergate on red enamel, surmounted by the crest of a ship. A Motto on a Blue enamel scroll reads “INCOR Harwich 1318.” This refers to the incorporation of Harwich as a borough in that year. Between the chain and the mayor’s badge is inserted a commemoration of Queen Victoria’s Golden Jubilee in 1887. It takes the form of an oval enamel portrait of the Queen with a Blue enamel garter bearing the inscription in Gold letters “Her Majesty Queen Victoria’s Jubilee Year 1887.” The portrait is surmounted by an Imperial Crown, backed by crossed Sceptres with Gold discs bearing the letters in Gold “IH” and “V”. The badge was the gift of the Mayor Henry John Vaux who presented it to the Council at a Special Meeting on June 27th, 1887. Harwich Town Council would like to thank ‘The Harwich & Manningtree Standard’ for use of their photographs throughout this section.